CNC TECH TALK MMS JANUARY 2018 34 mmsonline.com Processes and Programming The Effect of Lot Size on Productivity Understanding factors that contribute to your company's identity, and addressing those that are most important to your company, will dramati- cally improve its CNC machine utilization. In past months, I have discussed company type, repeat business and lead time. This month, I am focusing on lot size, which I define as the number of work- pieces produced during a single production run. Almost every process-related decision you make should begin with a simple question: "How many parts are we making?" The more parts to be produced, the more elaborate your processes can be. There will, however, be challenges throughout the entire lot-size spectrum. For this discussion, I define lot sizes as: • Extremely small (1-3 parts) • Small (3-20 parts) • Medium (21-100 parts) • Large (100-1,000 parts) • Extremely large (more than 1,000 parts) Process Considerations With smaller lot sizes and assuming program exe- cution time is relatively short, no special consid- eration need be given to workholding or cutting tool selection. Just about any process that makes an acceptable workpiece will work. But as lot sizes grow, so does the need to reduce program-execu- tion time while maintaining quality specifications. Any additional costs incurred because of a more elaborate process will be justified by the reduced time needed to complete the production run. With extremely large lot sizes, you should be able to justify anything it takes to get the last second out of the machining cycle. 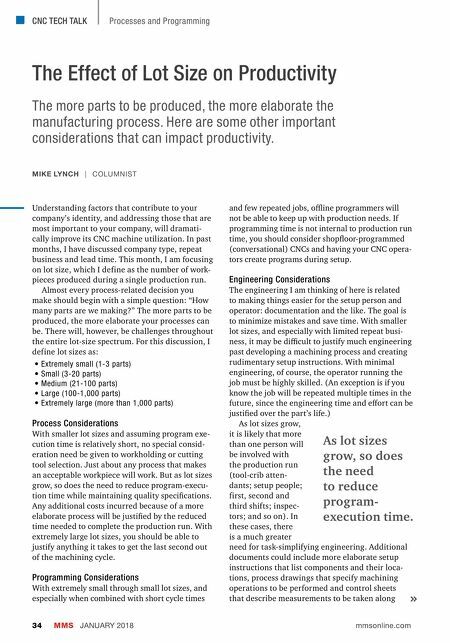 Programming Considerations With extremely small through small lot sizes, and especially when combined with short cycle times and few repeated jobs, offline programmers will not be able to keep up with production needs. 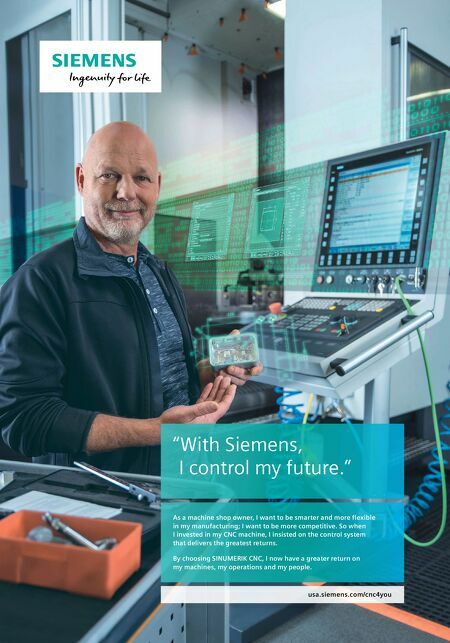 If programming time is not internal to production run time, you should consider shopfloor-programmed (conversational) CNCs and having your CNC opera- tors create programs during setup. Engineering Considerations The engineering I am thinking of here is related to making things easier for the setup person and operator: documentation and the like. The goal is to minimize mistakes and save time. With smaller lot sizes, and especially with limited repeat busi- ness, it may be difficult to justify much engineering past developing a machining process and creating rudimentary setup instructions. With minimal engineering, of course, the operator running the job must be highly skilled. (An exception is if you know the job will be repeated multiple times in the future, since the engineering time and effort can be justified over the part's life.) As lot sizes grow, it is likely that more than one person will be involved with the production run (tool-crib atten- dants; setup people; first, second and third shifts; inspec- tors; and so on). In these cases, there is a much greater need for task-simplifying engineering. Additional documents could include more elaborate setup instructions that list components and their loca- tions, process drawings that specify machining operations to be performed and control sheets that describe measurements to be taken along As lot sizes grow, so does the need to reduce program- execution time. MIKE LYNCH | COLUMNIST The more parts to be produced, the more elaborate the manufacturing process. Here are some other important considerations that can impact productivity.